Today we had planned to go on a day trip to Annapolis! When I conned convinced my husband to do this challenge with me, I offered that we could postpone this day trip since I knew that we would normally have planned to go out to lunch, grab coffee in the afternoon, and maybe stay for dinner. None of that would fit in a $60 budget. But the dwindling opportunities for good weather persuaded us to stick to our plan and go, SNAP budget and all! Breakfast had to be hearty to last us through the day. We planned to have eggs scrambled with some veggies in addition to our tea. Given our previous days’ of experience, my husband suggested we split a piece of toast with a slathering of peanut butter. A good call for a total of $2.26. We packed our lunch and snacks (which we learned are important!) so we could stick to our SNAP budget. Peanut butter sandwiches, carrots, celery, hummus, apples, and roasted squash seeds. And we filled our water bottles. All for $2.68. 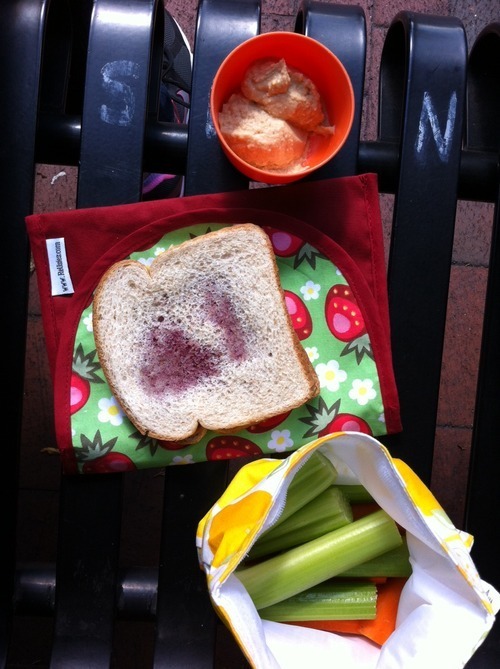 Our picnic lunch was enjoyed on a park bench, watching people and traffic roll on by. We packed up the rest of the veggies and seeds and put them back in the car to save for later. (My jelly leaked through the bread a little bit, but it was still delicious). The rest of the day was spent racking up 13,000 steps on the husband’s pedometer. By about 9,000 steps in, we started getting hungry. And unaddressed hunger leads to crankiness. Unfortunately our snacks were on the other side of town. Fortunately we saw the crankiness coming and made a pact to stay in a good mood even though we were hungry. And then we walked by an all-day breakfast joint. From their open door wafted the sinful scent of bacon. To my husband (who doesn’t ever get bacon at home from his pesco-vegetarian wife) this was torture! Surrounded by food, and not able to eat any of it. He checked again to make sure we couldn’t actually stop and buy anything, and I reminded him that we have $1.50 left in our budget for the week. He started to walk into a deli and then, realizing that all we might be able to afford was a bag of chips, changed his mind and walked out. We continued toward the harbor and smiled for some photos before heading back to the car. Once we scarfed down the remaining carrots and celery in the car, we reflected on the day. I was glad we continued with our day trip plans despite the twist of not being able to eat out. And I learned a lot. We were two grown adults capable of understanding what was happening and why we were starting to feel grumpy. What if we were walking all over Annapolis with kids in tow? Our grumpiness almost stopped our trip short, but with kids who can’t control their emotions with a pact, we certainly would have left early and in a sour mood. And if walking around on a day trip got more difficult while hungry, how much harder would it be working or going to school while hungry? We also realized that walking around all day was certainly more physical activity than we might get on an average work day, which means we burned more calories. And burned calories ask to be replaced. If money is tight and food is limited, moving less means needing to eat less. With all the promotion of physical activity for the sake of health, I hadn’t considered the real pros and cons an individual on a tight food budget would have to consider when deciding if and how much to work out. All this talking made the car ride home pretty quick. Once home, we reheated last night’s leftover macaroni and cheeze with an extra dash of salt and pepper for a total of $1.53 for both of us. Lessons of the day: feeling hungry leads to other unpleasant feelings. It really impresses me that you took the time to think about cranky kids. This is why we’ve learned the lesson of keeping snacks in my purse at all times, if not in bags for each of the kids so they can pull out snacks when they start to feel they need it. Surprisingly, kids can also respond really well to dealing with hunger, depending on the kids. My older two are usually pretty good about being hungry as long as I can give them a solid answer on when they’ll get to eat. They kind of keep their younger brother in good spirits too. Thankfully, the baby is breastfed, so while there’s no hope for convincing a hungry baby to wait, food is always around as long as he’s with me. I kind of wish everyone would take on a challenge like this. I know all too many people who don’t understand what it’s like not to be able to stop in and grab something quick when you’re hungry, no matter how badly you want it. Maybe policies would change if more people had to experience it.